Dyson Ball Animal 2 Vs. Dyson Multi-Floor Upright Vacuums (Key Differences): Both Dyson vacuums are very capable uprights. Both provide the suction and powered brushroll to clean carpets of dust, dirt and pet hair. Both are not lightweight vacuums, but heavy duty, high powered cleaning machines. All Dyson uprights are Bagless, where you empty the dust bin into a trashcan, with some of the allergens getting into the air. The key differences between the models is the color, airwatts suction (10% higher in the Animal 2), Electrical cord (Animal 2 is 5 feet longer), and the Animal version includes Dyson’s Tangle-Free Pet Tool. 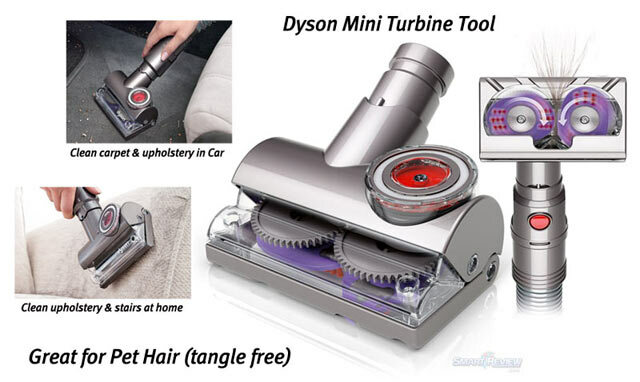 The Tangle-free turbine tool is great for pet hair and human hair removal. The tool is tangle free, so Pet Hair will not wrap around the counter rotating brushes. The Brushroll can be turned off on both vacuums for delicate rugs and hardwood floors. See the comparison chart below. Bottom Line: Both vacuums are very capable on all floor types. Both have the power to tackle pet hair, dust and dirt. The Dyson Ball Animal 2 has the edge with the tangle free turbo tool, longer power cord, and slightly stronger suction. If you have pets, the “Animal” version would be a better choice. What makes Dyson Unique- Main Differences: Dyson invented the cyclonic bagless vacuum, and has been an innovator in the bagless vacuum category. Dyson uses the same type of polycarbonate plastic used in crash helmets and riot shields for durability. Dyson is known for strong, powerful, suction. One area that Dyson stands out is its tools. One in particular is the Tangle-Free Pet Tubine Tool, which we believe is the best air driven tool for pet hair on the market. We have seen this tool demonstrated, and it can pick up long hair and even shoelaces without wrapping around the brushes. Both of these vacuums use ball technology for easy manuevering around obstacles. This model standard comes with Dyson Animal Corded Vacuums.